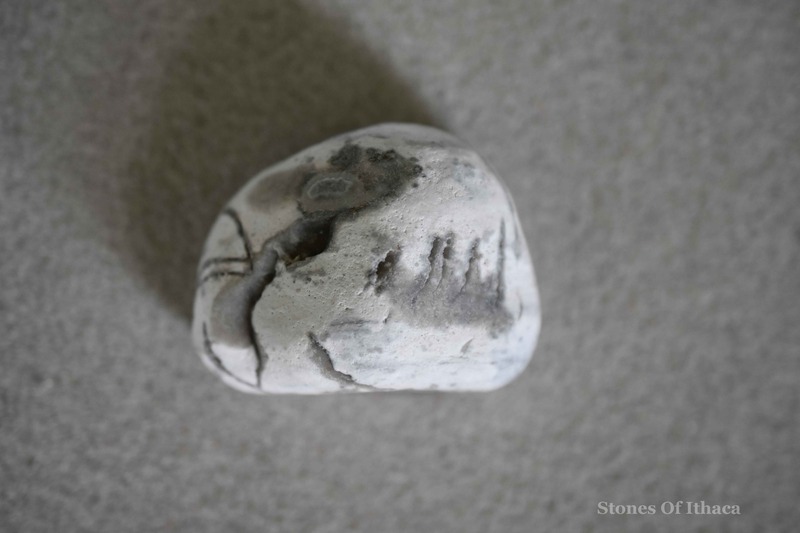 This is one of only three Odysseus stones I have found on the beaches of Ithaca. They are not so easy to come by. Two of them appeared on Polis Beach, the beach below the town of Stavros, which is where the old polis or city was located and is only a stone’s throw from the Palace of Odysseus. I like to imagine that he came here to bathe. It is certainly more protected than the beaches on the north side of this promontory, though it may also have been used to protect the fleet. On this beach is the Cave of Loizos, where votive tablets to Odysseus left by sailors on their way to Italy have been discovered. I see here two facets of the Greek hero: the bow on the left, and the ship on the right. He seems to be holding the bow and is facing in that direction. It was his ability to string the bow on his return to the Palace that unleashed the slaughter of the suitors and his subsequent reunion with Penelope. The ship, on the other hand, is obvious. Odysseus was a good sailor and is famous for having wandered the seas for ten years in Homer’s book the Odyssey. I am struck by the figure holding the bow. The eye is like a map, a map of longing perhaps, and the clothes and hair could be those of a woman – Penelope herself perhaps? Meanwhile, in language, we like to rely on our reason, what our minds can comprehend and preferably also what our eyes can see. Ever since the Enlightenment, we have become increasingly reliant on our capacity to reason and to rely only on what our senses can confirm to us. We forget that perhaps in order to see something we need to have our sight cleansed, and this only happens through faith. Also, certain things have to be taken on faith. I sometimes think one of the main arguments for the existence of God is that God is love and, as such, he would never lie to us. For me, therefore, “reason” is a “snare” (without the o), and so is our desire always to have the “answer” (without the w, which is the Greek letter for o). As with “live” and “love”, or “sin” and “son”, we again have to count down from the ego (I to O, 1 to 0) and to turn away from the “logic” of Aristotle to the “Logos”, the Word himself, Jesus Christ. We become enveloped by him and keep our eyes on him, at which point the scales fall from our Is.